This go kart is great for kids. It's much safer and more stable than a gas scooter, which makes it a great starter motorized vehicle for your kids. Very fun for all ages. 250 pound weight limit. Adults love it too, yes you can fit in there! 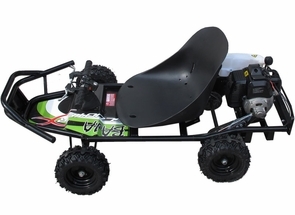 This Go Kart will reach speeds of 35 mph and is equipped with a centrifugal clutch (automatic) and a pull starter. We consider these karts to be the best and fastest (for their size) on the market. Moto Tec 49.99cc Power Kart in black is the best quality gas go kart on the market. Electric ride on ATV 4 Wheeler Dune Buggy Go-Karts are powered by a super strong 48 volt 1000 watt electric motor that lets you achieve speeds up to 20 MPH!